I am pleased to provide you with the Executive Summary of the NYS Assembly Ways and Means Committee's Economic Report for 2004 and 2005. This report continues our commitment to providing clear and accurate information to the public by offering complete and detailed assessments of the national and State economies. The full report is available on the Assembly's website (click here). Slow employment growth and abnormally weak labor markets have been the hallmark of the national recovery from the 2001 recession. New York has been particularly hard hit, fairing worse in both employment loss and declining wages than the nation as a whole. The September 11th terrorist attacks and difficulties in the securities industry, which is a vital sector of our State's economy, have intensified the recession's impact on New York State. 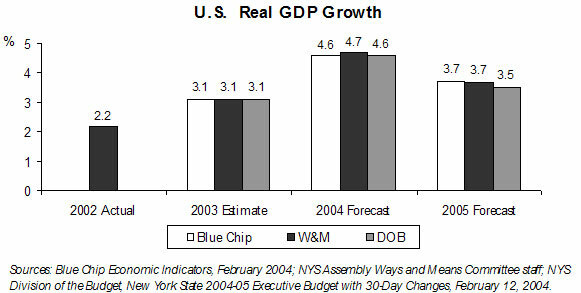 Moderate growth is expected in both the national and State economies in 2004. At the same time, the two areas that are anticipated to continue to show weakness are wages and employment. Both the State and nation are estimated to have ended 2003 with a year-over-year decline in employment, as the "jobless recovery" persists. In New York State in particular, wages, which experienced their worst year-over-year decline since 1938, remain sluggish compared to historical growth rates. Much of New York's eventual recovery will be driven by a rebound on Wall Street, increased variable compensation levels, and the continued economic recovery of New York City's financial sector. The Ways and Means Committee staff's assessments and projections presented in this report are reviewed by an independent panel of economists, including professionals from major financial and manufacturing corporations and prestigious universities, as well as respected private forecasters. Assembly Speaker Sheldon Silver and I would like to express our appreciation to the members of this Board of Economic Advisors. Their dedication and expert judgment have been invaluable in helping to refine and improve the forecasts. While they have served to make the work of our staff the best in the State, they are not responsible for the numbers or views expressed in this document. I wish to also acknowledge the dedicated and talented staff of the Assembly Ways and Means Committee and the many hours of work that went into producing this report. They play a vital role in our State's budget process. In addition to this report, the Speaker and I have asked the Ways and Means staff to continue their efforts and develop additional materials which we believe will be beneficial to you and to your constituents. As we continue our efforts toward enacting a budget that is fair and equitable for all New Yorkers, I look forward to working with each of you. 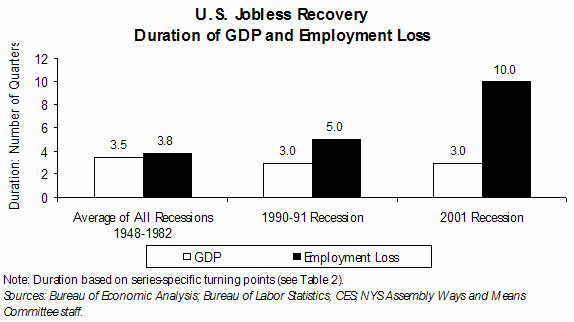 Lackluster employment growth and weak labor markets have characterized the United States recovery since the 2001 recession. Employment losses have been experienced across most sectors, with the manufacturing and information sectors being hit particularly hard. 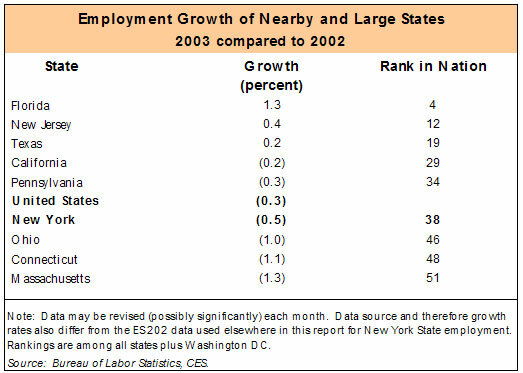 New York State has been especially affected, faring worse in both employment and wages than the nation as a whole. The September 11th terrorist attacks and difficulties in the vital securities industry intensified the recession's impact on the State economy. Both the national and state economies are expected to experience faster growth in 2004. Growth so far has been driven in large part by robust consumption spending as well as a large swing in investment spending compared to 2001. Positive developments in recent months include continued consumer spending incentives, low interest rates, rising stock prices, and strong growth in corporate cash flows. Dramatic increases in federal defense and public security spending along with tax cuts have also helped to add momentum to the economy. Improvements in the labor market are expected to occur gradually as lethargic job creation is anticipated while the "jobless recovery" drags on. Both the country and State are estimated to have ended 2003 with a year-over-year decline in employment. Much of New York's eventual recovery will be driven by a rebound in the securities industry, increased variable compensation levels, and the continued economic recovery of New York City's financial sector. In terms of output, most economic indicators are pointing to continued recovery from the 2001 recession. After growing 3.1 percent in 2003, the NYS Assembly Ways and Means Committee staff forecasts that the national economy, as measured by Real Gross Domestic Product (GDP), will grow 4.7 percent in 2004. When employment's own peak and trough dates are used instead of the National Bureau of Economic Research's (NBER) business cycle dates, private sector employment loss this time around is not only the largest (3.3 million jobs) but has persisted the longest (ten quarters) since World War II. Though the duration of decline in real GDP was shorter than the post-World War II average, the duration of employment decline was longer. This indicates an increasing disconnect between output growth and employment growth-a "jobless recovery." The largest sectoral loss of employment in the recent recession is in manufacturing. Between the first quarter of 2001 (when the recession started) and the third quarter of 2003 (the last quarter of total employment decline), 15.0 percent of the nation's manufacturing jobs were lost, while 4.4 percent of U.S. manufacturing jobs were lost between the second quarter of 1990 and the third quarter of 1991 (the period of employment decline in the 1990-91 recession). In the recent employment downturn, 2.6 million manufacturing jobs were lost, whereas in the downturn of 1990-91, 0.8 million manufacturing jobs were lost. U.S. manufacturing has become increasingly specialized in industries with high technology content. Between 1980 and 1998, the output of U.S. manufacturing as a whole increased 70.0 percent, while the output of high-tech manufacturing industries grew 182.9 percent. Government employment grew 3.2 percent during the recent employment decline, compared to only 0.3 percent growth in the 1990-91 employment downturn. Construction employment, on the other hand, declined much more severely in 1990-91 than in the recent employment downturn. After rising rapidly throughout most of the 1990s and into 2000, stock prices, as measured by the Standard and Poor (S&P) 500 Index, declined sharply from late 2000 until early 2003. The decline took away about half of the stock price gains experienced since 1990 and contributed significantly to the 2001 recession and the slow recovery. Since the first quarter of 2003, stock prices have once again been rising, and they are expected to continue to rise throughout the forecast period. The NYS Assembly Ways and Means Committee staff estimates that the New York State economy continued to lose jobs (over the same period of the previous year) until the fourth quarter of 2003, resulting in a year-over-year nonfarm employment decline of 44,800 jobs or 0.5 percent in 2003. 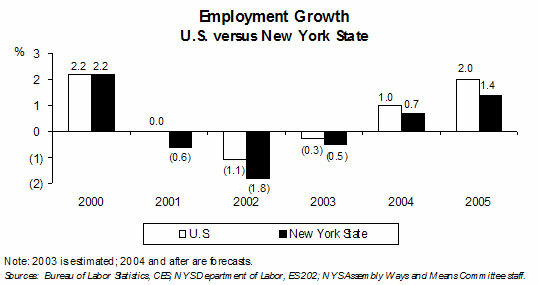 In general, New York State was hit harder by the 2001 recession than the nation. This is particularly true for wages, which experienced a 2.6 percent decline in 2002, the worst year-over-year decline since 1938. 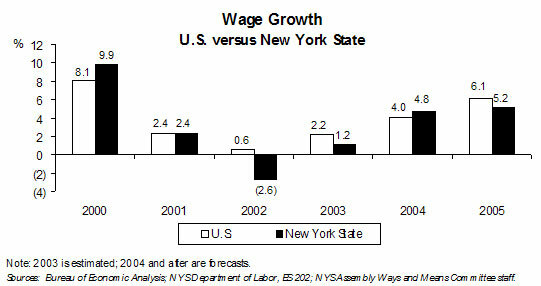 New York State wages declined by an average of 0.9 percent per year during the recent recession (fourth quarter of 2000 to the second quarter of 2003). From 1980 to 2003 wage growth averaged 5.4 percent. Between 1995 and 2002, wages in New York City increased by $65.2 billion. This accounts for 60.5 percent of the wage gain in the State as a whole. The wage gains in New York City were led by the increase in the Finance, Insurance, and Real Estate (FIRE)1 sector of $22.5 billion. The other downstate regions gained $24.5 billion in wages. Downstate as a whole represented 83.3 percent of the State's total wage growth over this period. 1 Definitions of sectors have changed under the new North American Industry Classification System (NAICS). The Committee staff has grouped some NAICS sectors together, including combining finance, insurance, real estate, rental, and leasing into the FIRE sector. See Appendix A for more details. 2 Calculation is based on Current Employment Statistics Survey (BLS 790) data. The FIRE sector accounted for 22.6 percent of the employment loss in New York City between the fourth quarter of 2000 and the second quarter of 2003. The State's FIRE sector accounted for 16.7 percent of the employment loss in the State. FIRE accounted for 90.2 percent of the wage loss in New York City between the fourth quarter of 2000 and the second quarter of 2003. The State's FIRE sector accounted for 147.6 percent of the total wage loss in the State, implying that outside of this sector wages in the State increased. 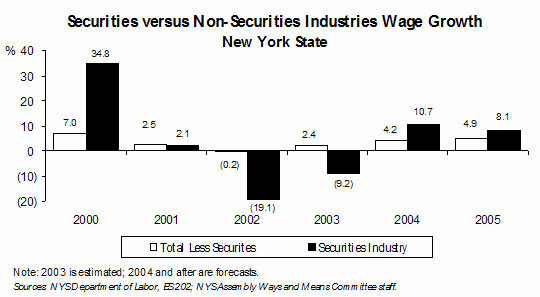 Almost the entire 2.6 percent decline in State wages experienced in 2002 can be attributed to the securities industry. Excluding this industry, wages dropped only 0.2 percent. Due in large part to the volatility of its variable compensation, securities industry wages are vital to understanding total wages in New York State. The securities industry makes up about ten percent of wages in New York. This is large for a single industry, but the industry's importance to understanding wages is even greater. In the last ten years, 19 percent of total wage growth and 43 percent of total wage variance can be attributed to the securities industry. The NYS Assembly Ways and Means Committee staff estimates that New York's total variable compensation, which was $40.7 billion or 10.4 percent of total State wages in 2001, declined $7.0 billion or 18.0 percent year-over-year during 2002. It is estimated to have declined 8.4 percent during 2003 due mainly to weak securities industry bonuses early in the year. Variable compensation is forecast to increase by 15.0 percent during 2004 as securities industry profits have improved and corporate profits are expected to continue improving. According to the NYS Assembly Ways and Means Committee staff, securities industry variable compensation dropped $5.8 billion or 28.5 percent in 2002. It is estimated to have declined another 22.4 percent in 2003. This decline occurred despite rising securities industry profits for the year because variable compensation changes typically lag changes in profits. It is forecast to grow 25.1 percent year-over-year in 2004 and 10.7 percent in 2005. 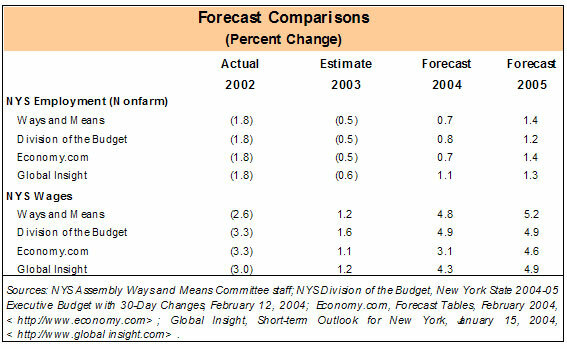 New York State employment is forecast by the NYS Assembly Ways and Means Committee staff to rebound during 2004, growing 0.7 percent year-over-year and 1.4 percent in 2005. The NYS Assembly Ways and Means Committee staff estimates that New York State nonfarm wages grew 1.2 percent year-over-year in 2003 and forecasts growth of 4.8 percent in 2004. Although this is a significant improvement from 2002, it is still sluggish compared to historic growth rates of 6 to 9 percent during the expansions of the 1980s and 1990s. The Committee staff's 4.8 percent wage growth forecast for 2004 is 0.1 percentage point lower than the Division of the Budget's 4.9 percent forecast, 0.5 percentage point higher than Global Insight's 4.3 percent, and 1.7 percentage points higher than Economy.com's 3.1 percent. 3 Global Insight and Economy.com use the employment data from the Current Employment Statistics Survey (BLS 790) compiled by the Bureau of Labor Statistics and the wages and salaries data compiled by the U.S. Bureau of Economic Analysis (BEA). The NYS Division of the Budget and the NYS Assembly Ways and Means Committee staff use the Covered Employment and Wages data (ES 202) from the NYS Department of Labor. The NYS Assembly Ways and Means Committee staff prefer to work with ES 202 data because revisions to these data are much smaller than in the other data. Both the BEA and BLS 790 data are "benchmarked" and adjusted towards the Covered Employment and Wages data, because the coverage of the Covered Employment and Wages program is almost universal: 98 percent of all establishments are included in the counts of the Covered Employment and Wages program. The comprehensiveness of the ES 202 coverage makes the data more accurate. However, the Current Employment Statistics Survey and the Bureau of Economic Analysis data are available more quickly compared to the Covered Employment and Wage data.